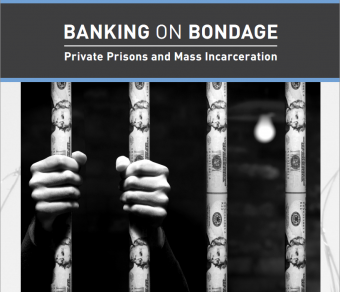 On this blog several posts are focussing on the topic of private Banks creating money out of nothing – with special regard to  and  – offering analyses on the far-reaching social-economic consequences of the financial system built upon such practice. In a genuinely democratic world, mainstream academia and media would address this subject with top priority and would warn the public of the alarming global trend arising from a global financial system that is ruled and exploited by an unelected minority, yet this discussion is excluded even from the curricula and textbooks of related studies. Due to the special and global relevance of this issue – affecting all countries with the imminent and persistent threat of the same Debt Crisis as the one that led to annexation of Greece [1,3] – here we rephrase and outline again the formerly elaborated main points, along with the implications we can capture after connecting the dots among them. 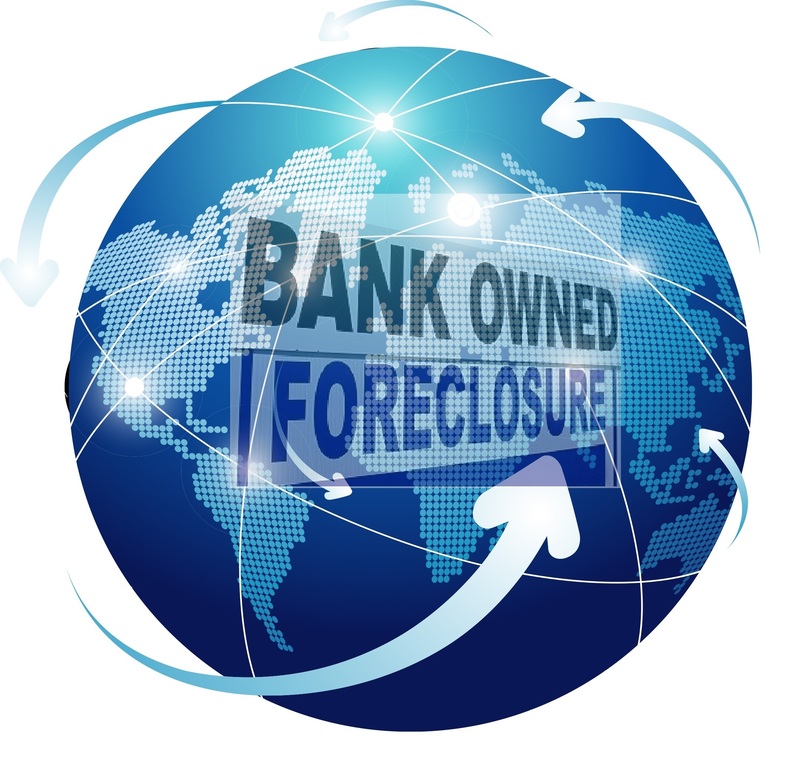 1) During the several past decades of the neoliberal financial and economic deregulations, a secret transformation has been carried out in the global banking sector, according to which whenever private Banks lend money, they do not act as intermediaries between savers and borrowers; rather, the loaned money is created by the Banks as new money, in the form of electronic/digital payment promises: promissory notes/IOUs (“I Owe You”) . 2) Upon accepting/taking a loan, the borrower gives a payment-promise (IOU) to the creditor Bank, but since the Bank does exactly just that as well, a loan-transaction is nothing but mere exchange of two payment promises: one given by the borrower and one by the ‘creditor’ Bank. However, the Bank-issued payment-promise (IOU) is regarded as ‘money’ – oddly enough the promise is viewed as its opposite, the very fulfilment of the promise – whereas the borrower’s payment-promise remains what it is, a legally binding yet to-be-fulfilled payment-obligation . 3) Since ‘creditor’ Banks do not draw funds either from savings or from any other pre-existing money-base at their disposal, Banks merely pretend to take risks upon lending, and on such false pretence they demand that the ‘money’ they never gave away, has to be ‘repaid’ by cash or by other tangible values derived from actual productive work performed in the economy. The implications of this fact are many-layered and immensely significant, yielding grave detrimental effects not only on economy but on all aspects of our society. 4) Private Banks give loans not only to individuals but also to Governments [4, 5], and they do so extensively and continuously, accumulating countless $ trillions of Government Debts – also known as public/sovereign Debts – all over the world , on behalf of the citizens who never endorsed, never received and never benefited from these ‘loans’ . The many $ trillions of Government Debts arising from Banks issuing mere IOUs to Governments in exchange for Governments’ IOUs to Banks, are recorded as ‘payment obligations’ to be fulfilled by the respective country’s taxpayers, and these Debts are referred to as the pretext of an imposed sequence of Bank-bailouts and neoliberal fiscal policies: Cuts, Austerity and Privatisations. As a result of these practices, what we could witness in the context of Greece is a global ‘sword of Damocles’ hanging above all countries [1, 5, 8, 13]. 5) The so-called Bank Bail-outs, along with the Bank-dictated policy of Austerity and Cuts, have been consistently imposed onto many countries all over the world, under the false pretence that such measures are needed to ‘rescue’ Banks, or even save the entire financial system of a region, with the attached false promise that reducing public spending will trigger economic Recovery and will eliminate Government Deficit and Debts. However, it is proven both by economic theory and practice – and by basic common sense – that contracting aggregate expenditure via Austerity achieves the exact opposite of the “expected” effects: it contracts the economy, hence deepens Recession and Crisis [1, 7], which then leads to further Bail-outs and higher Debts. The theory is demonstrated by these charts , explained by Nobel Prize winner economist Paul Krugman in the respective documentary  and the actual real-life example of Greece provides empirical proof of how Austerity destroys economy [1, 3]. 6) Privatisations are in essence the final step in the process of transferring all taxpayer-earned tangible values into the private hands of Bankers, who do nothing but entering phantom money (payment promises) into their systems. In order to convert these digits into actual values, from time to time Banks pull the strings – in the form of Bank-Bailouts – to collect hard assets in exchange for the phantom digital ‘money’ they create . Despite the fraudulent and economy-damaging character of hedge-fund transactions – and of all speculative, fictitious, non-productive, ‘bubble’-generating Bank-manoeuvres -these are not more than red-herrings compared to the tremendous implications of a continuous grand-scale activity of Banks “buying” actual values, all cities, countries and continents etc, by mere keystrokes (IOUs). 7) Since Banks issue the very money they ‘give away’, the operation of Banks does not depend on actual cash-flows and cash-reserves, savings or other restrictive monetary/regulatory factors, thus the idea of insolvent “bankrupt” Banks, let alone the threat of collapsing Eurozone, the consequent ‘necessity’ of rescuing Banks via “bailouts” is just as misleading idea as ‘expecting’ economic expansion from the neoliberal measures that are contracting the economy. 8) Upon the false pretence as explained above, Banks and collaborating puppet-Governments – such as the Syriza Government in Greece or the Cameron Government in UK – subjected most countries under Crisis and unrecoverable amounts of Government Debts, threatening with the same disastrous outcome – loss of national sovereignty, total economic meltdown, mass-poverty, mass-suicide and mass-emigration – as the one we witnessed in Greece . 9) The implications of this fact have the most severe impact on society, keeping the entire world in a process of impoverishment via the Debt-Austerity-Crisis-Debt vicious cycle . The final outcome of this process is the same globally as what we witnessed through the Greek Debt Crisis . When we look beyond the deceiving media-façade, we find that foreign private individuals hiding behind the EU, IMF and ECB – with the collaborating puppet Governments of Greece – annexed the entire country of Greece, foreclosed its historical heritages such as the Acropolis, and demanded even the sacrifice of the poorest Greek pensioners’ income in exchange for the mere computer digits entered in the respective Banks’ accounting systems. 10) At present, following the ‘successful’ Greek experiment, all puppet-Governments keep their countries on the same path as the one leading to the Greek Debt Crisis [1, 13]. Any national Government’s acknowledgement of the corruption-based, unrecoverable amount of Government Debt (often referred to as “odious debt”) leads to the end of democracy and national sovereignty of the respective country . This trend implies the imminent threat that the citizens of all countries are losing freedom and ownership of their countries to the global financial oligarchy. 11) To rephrase above: the case of Greece is far from being a special case ; in fact the tragedy of Greece reflects the near future of all countries [8, 13, 14]. The large private Banks and Governments effectively serving Bankers are performing a hostile takeover of all countries of the world, by demanding all assets, values, hard cash, lands, natural resources, buildings, historical heritages, businesses, etc, in exchange for the so-called “money” they create out of nothing. 12) The global status quo as per the list of IMF debts  reflects the absurd assumption that the individuals who issue phantom $ trillions and give these as “credit” to national Governments, contribute so much value to our societies that the whole planet ended up being indebted to these few individuals. This idea is obviously grotesquely false in its own right, let alone the additional circumstances that the assumed “investing” achievements of these Banks have proven to be grossly counter-productive, even destructive, as the disastrous fruit of their works clearly demonstrates. As a result of the activities of these Banks, all countries have been locked into an ever-intensifying Crisis and increasing Debt, the middle class is disappearing from the face of the Earth, the world is filled with blood of wars, mass-poverty and hunger, and even the once well-to-do Western world is sinking into abject poverty. 13) All elements and outcomes of this ongoing financial war are kept in place by the imperialist business-, banking- and political elites of the Western world. In addition to the countless dysfunctions of Capitalism, the process of several individuals effectively “buying” the planet via mere computer keystrokes, is the ultimate reason behind the ever widening gap between the richest 1% and the rest of the world. This is why it is a gross misconception to assume any “fair competition” in the current paradigm. It is impossible to compete with those individuals who own the money of the world by simply issuing the money of the world, while everyone else is obliged to perform value-adding productive work under the burden of individual and public Debts, and amidst the conditions of Austerity and contracting Economy, to produce and “repay” the monetary value of the money the Banks pretend to lend them. It is merely icing on the cake that we, who borrow the newly invented digital money from Banks, are obliged to pay “interests” on something that does not even exist as money, let alone being the saving of someone. 14) The very financial system based upon private money-creation is the actual reason why all countries are subjected to a state of artificially induced Crisis. This is why – contrary to the media-claims – there is no actual economic recovery for the majority [11, 12]. This is why the middle class is disappearing in every country, the super-rich accumulate wealth in unprecedented amounts, while the living standard of large masses all over the world is approaching the poverty line. It is but a part of the grand deception that the establishment-owned mass-media deny this fact, in order to sustain the belief that those who do not sense the positive effects of the alleged Recovery can blame themselves rather than blaming the system. The victim-blaming as a general pattern underlying this system, is clearly observable in this sense as well. In the virtual reality generated by mass-media, each individual within the vast majority who fell victim to the global financial war, remains misinformed and in isolation, hence remains under the deception that it is their own fault if their profession offers no jobs, no promotion, no prospect, or if their job offers no living wage. 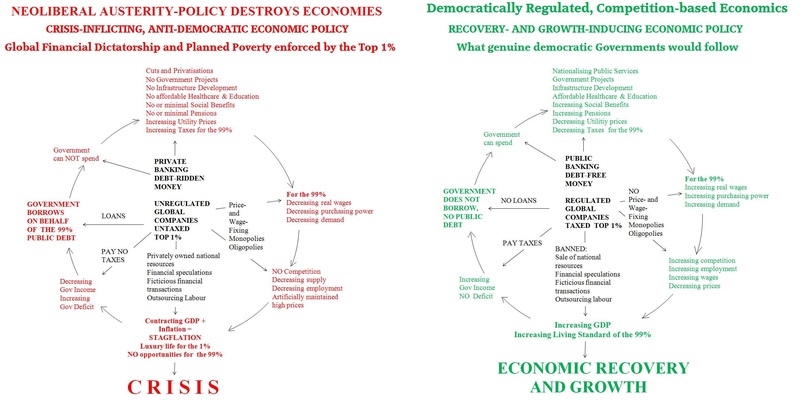 15) The attached flow-charts have been created to demonstrate the contrast between the status quo and a potential democratic system that would lead to actual economic Recovery . A potential system with democratic oversight and regulation of Banks and of the Economy, would eliminate monopolies of a few and poverty of the masses, would allow for financing small enterprises, would promote decentralised, diverse and innovative business practices, would establish equal opportunity to access financial resources without limiting such access to a privileged few; it would boost development of infrastructure, affordable housing, welfare, healthcare, green energy, etc. It is this war: the financial world war – that has been going on silently for many decades – is what we find as the root-cause behind all other forms of war, genocide and planetary destructions listed in an earlier post . 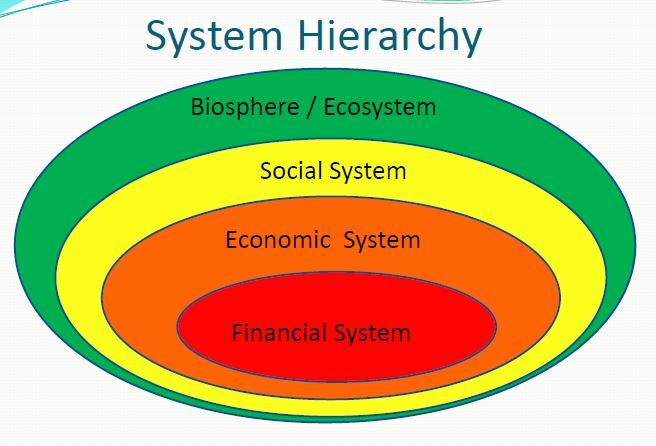 A while ago, when I started research on money-creation by Banks, I found a diagram  on the net, which aptly demonstrates how our societies are shaped by the embedded layers of various systems. The reason why our societies are dying: because the very core of our systems, the financial system driving all else, is corrupt to the core. 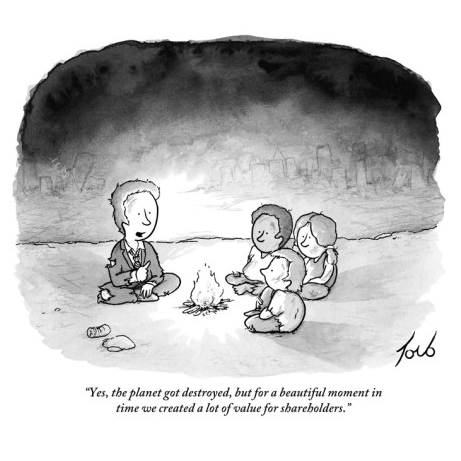 Those who derive an objective conclusion from subjective experiences, and derive the entire process-flow from a mere snapshot, thus believe that the financial-economic-political status quo is a functional and benevolent one as long as they as individuals are allowed – for the moment – to survive in the system, fail to see the big picture. The big picture, represented by the Crisis-side of the charts , clearly conveys: this vicious cycle eventually reaches everyone in every segment of society. In Greece, as the empirical facts and data revealed in documentary  testify, the middle class suffered the worst damage in consequence of the IMF- and Government-imposed severe Austerity measures and Privatisations. This is due to the fact that economy is a highly complex system with interrelated cause and causation relations, in which the cascade effects of such policy yield an accelerating process of pulling the entire economy into an infinite loop of poverty. The position of those who dismiss this issue as a non-existent one, is similar to those happily floating on a river, oblivious to the fact that the river ends up in a deadly waterfall. When all the “goers-with-the-flow” will reach the waterfall-fate of Greece – either as individuals or as citizens of a country sold out to Bankers – it might be too late to reconsider their stance. Now is the time to start swimming upstream. The above analogy applies to the popular sentiments favouring Capitalism in general. Even if it was true that free-market economy, and the system Capitalism invariably arising from free (=unregulated) economic activities, is the way to mankind’s prosperity (it isn’t), the price of whatever one might perceive as “individual benefit” is achieving it under conditions that invariably lead to the destruction of ecology and of the planet itself. Therefore, it is fair to say that such position is erroneous and self-defeating in every sense. Lords and Serfs (2): ‘modern banking system’ or the grandest fraud in history? Lords and Serfs (1): ‘modern banking system’ or the grandest fraud in history? I’m stilll reeling from the analysis of the system as it is, as it’s been created. I just can’t believe it was accidental yet I can’t quite believe that it was planned this way. Was it? ?